D writes: My wife and I were recently totally screwed by Two Guys Auto on McGuinness. They did about $1200 of unauthorized work, charged us for authorized work they didn’t do, and did some things dangerously bad, not to mention getting belittled when confronting them about it. Anyway, looking on-line (unfortunately after the fact), I notice a BBB rating of F and a lot of similar stories on Yelp/Citysearch (next to suspiciously similar praises but that’s another story). Thanks a bunch and hopefully my next tip/email will be on something fun like kittens! 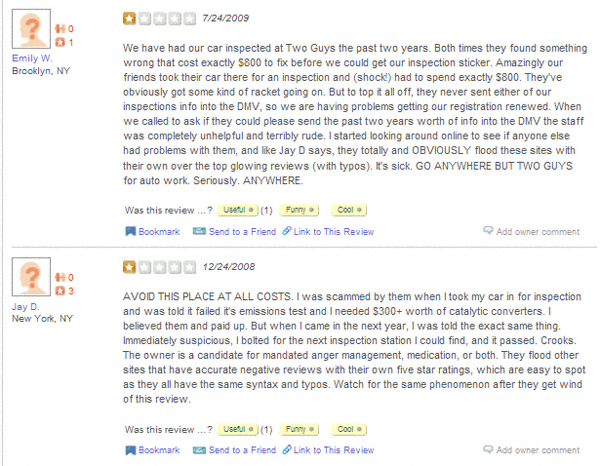 I’ve looked at the Yelp and Citysearch reviews for Two Guys Auto. The Citysearch reviews are by and large positive; the Yelp reviews, on the other hand, are either very positive or negative. Here are some examples to give you an idea of what I am talking about. Have you had problems/issues with Two Guys Auto? Do you have a recommendation for a reliable mechanic in north Brooklyn/Long Island City for Woody? If so, please shoot D an email at: twoguysproblem (at) gmail (dot) com. ugh, that’s horrible. 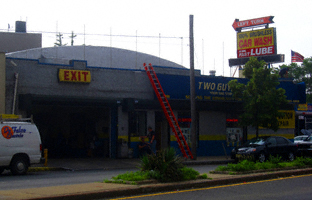 I can’t help out wrt 2 guys, but in terms of recommendations, I’ve had very good service from Junior’s Pulaski Auto Repair on McGuinness, between Green and Huron (next to the Gulf gas station). They are super honest, do good work, reasonably priced, accommodating in terms of dropoff/pick up, etc… at least that’s been my experience the last year or so since I’ve started going to them. I go to Zygi’s repair on Manhattan. Never had a problem with them. I’ve had work done there. When a beer bottle was smashed through my rear window late one Saturday night, I had to take it there to replace the windshield. They were fast, the price was fair, and when I had to go back and have them add information to the invoice in order to submit it for insurance, they cheerfully did so. The biggest point in their favor was that *they cleaned up all the class in the car*. We didn’t ask them to and certainly didn’t expect it but there wasn’t a shard of glass in the vehicle when they gave it back (and they washed it, too). Yes, they have a car wash and sure, sending the car through isn’t a big deal, but someone had to go in and vacuum the interior within an inch of its life (the entire window shattered as we drove the car over there). I am not trying to say that these guys are the best shop in the world but here is a positive, non-shill review. 6 years ago, when I needed a local garage, I went on Car Talk to find a mechanic (which I’m not sharing because I’d like him to remain my mechanic. Yes, I’m selfish, but you can do THE SAME THING). I would recommend Car Talk over Yelp because most people who use Yelp in NYC don’t have a car and the people who do have a car don’t use Yelp. As a result you’ll get a very skewed view of what the situation is.